As Fox Sports’ biggest summer ever closes with this week’s MLB All-Star Game, Fox certainly shows no sign of fatigue technologically. Not only is the network rolling out a SkyCam system for actual game coverage for the first time in MLB history, Fox will also deploy its largest high-speed–camera complement (including all 12 primary game cameras), two C360 360-degree camera systems, and ActionStreamer POV-style HelmetCams on the bullpen catcher, first-base coach, and Minnesota Twins pitcher José Berríos at Washington’s Nationals Park. 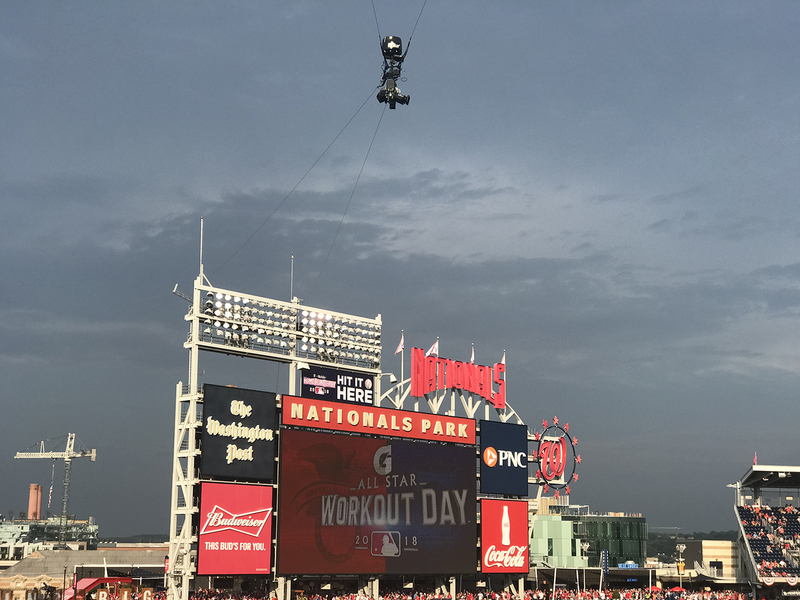 Although Fox deployed a Spidercam system at the 2016 All-Star Game in San Diego, this year marks the first time a point-to-point aerial system has been used for in-game coverage, according to Fox Sports and SkyCam execs. 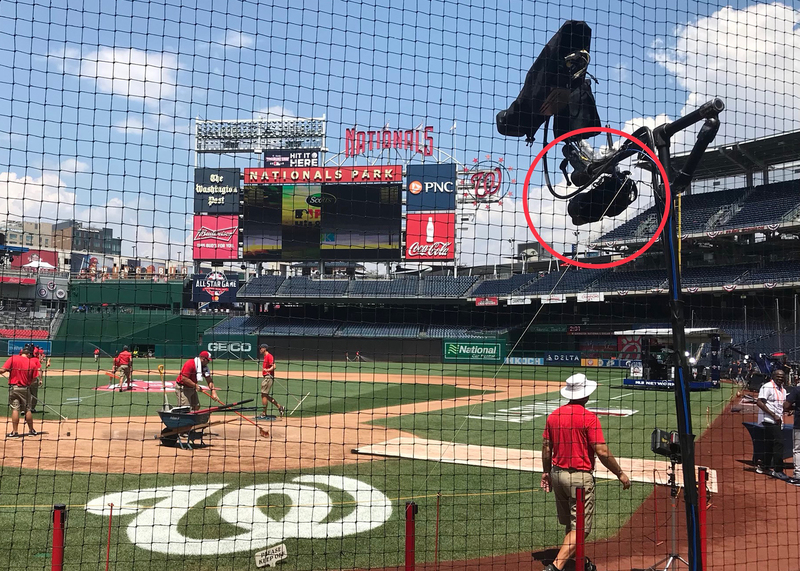 Two years ago, the system was used primarily for commercial bumpers and beauty shots, but the SkyCam system at Nationals Park is going to see plenty of action during the game itself. The introduction of SkyCam on MLB coverage is a long time coming (although ESPN has deployed SkyCam on the College World Series in the past). Nationals Park’s vast open area in left field and left center field provided an ideal environment visually and also allowed the system to be installed (mounted on the center-field scoreboard and light towers in far left field) so that it would not interfere with action on the field. Having made its first All-Star appearance in Miami last year, the team at C360 is back for Fox Sports. Two C360 6K+ (25X HD), 60p camera systems are onsite providing 360-degree outputs: one at low home, one attached to the SkyCam system in left field. One of two C360 360-degree 6K+, 60p camera systems on hand at Nationals Park is located at low-home. Fox has the ability to integrate the low-home PTZ position live into the telecast, as well as for replays with full stop-action and zoom capabilities. Meanwhile, the SkyCam system is providing an immersive live stream to a YouTube 4K channel delivered to an offsite Fox VIP event. This stream will allow the viewer to virtually navigate the entire field with a touchscreen tablet, as well as integrate Fox Sports’ linear feed and ticker as well. 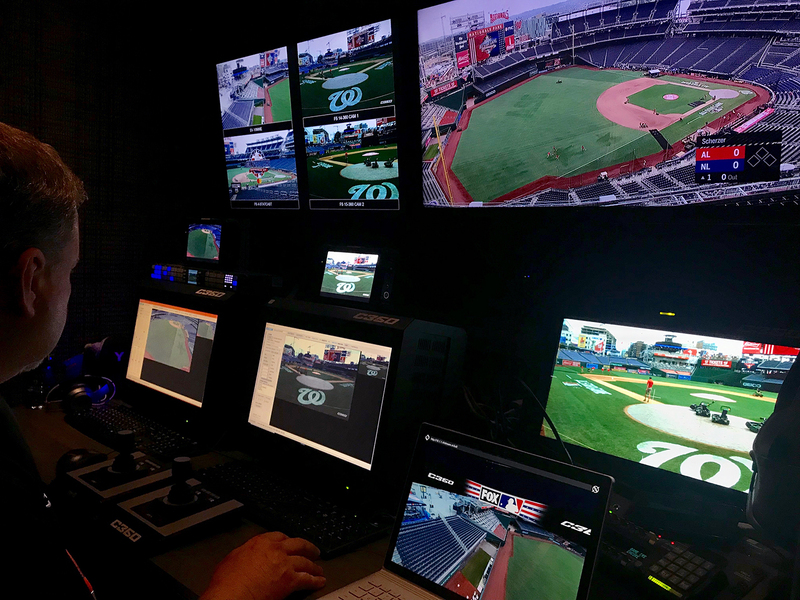 The C360 workstation at MLB All-Star will drive positions at low-home and on the Skycam in left field. Fox has also brought out several ActionStreamer wearable POV camera systems, which it plans to deploy on the bullpen catcher and the first-base coach. (UPDATE 7/17/18 10 p.m. ET: the HelmetCam also appeared in Fox’s telecast on Minnesota Twins pitcher José Berríos as he took the mound for the fifth inning) The technology was recently used by Monumental Sports Network, which live-streamed HelmetCam feeds from two players during an AFL game between the Washington Valor and the Philadelphia Soul. Fox Sports will have it’s largest high-speed camera complement ever at a MLB All-Star Game, including slo-mo on all 12 of its main game cameras. 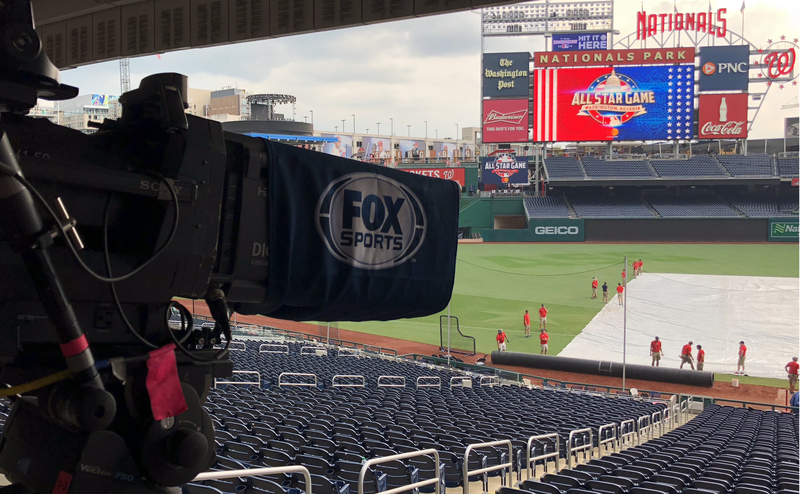 Between game coverage and studio shows, Fox Sports has deployed a total of 36 cameras (up from 33 last year) at Nationals Park, highlighted by its largest high-speed–camera complement yet for an All-Star Game. Building on the efforts of Fox-owned RSN YES Network, all 12 of Fox’s Sony HDC-4300 primary game cameras are licensed for high-speed — six at 6X slo-mo and six at 2X slo-mo. This is made possible by the ultra-robust infrastructure of Game Creek Video’s Encore mobile unit, which is making its All-Star debut. Fox will also have two Phantom cameras running at roughly 2,000 fps (at low first and low third) provided by Inertia Unlimited and a pair of Sony P43 6X-slo-mo robos at low-home left and low-home right provided by Fletcher. Fletcher is providing nine robos in all — including low-home Pan Bar robo systems that debuted at last year’s World Series — and Inertia Unlimited is providing a Marshall POV in both teams’ bullpen and batting cage. CP Communications is supplying a pair of wireless RF cameras: a Sony P1r mounted on a MōVI three-axis gimbal and a Sony HDC-2500 handheld. An aerial camera provided by AVS will be used for beauty shots — no easy task in security-conscious Washington. Inside the compound, a reshuffling of USGA golf events allowed Game Creek Video’s Encore mobile unit (A, B, and C units), home to Fox’s U.S. Open and NFL A-game productions, to make its first All-Star appearance. 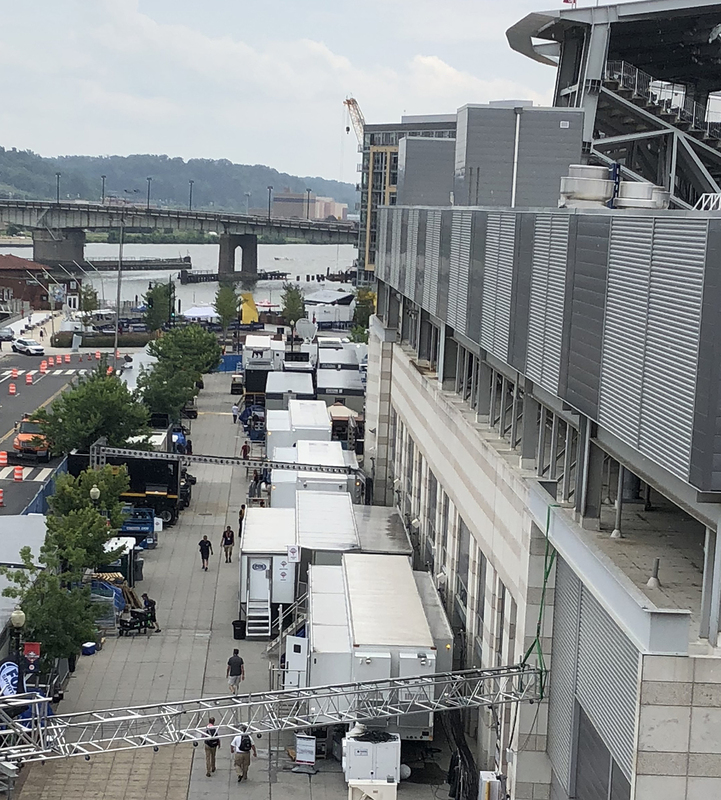 Fox Sports and MLB Networks truck compounds are split between the truck dock inside and this outdoor area adjacent to Nationals Park. The primary control room inside the Encore B unit will handle the game production, and a second production area has been created in the B unit to serve the onsite studio shows. 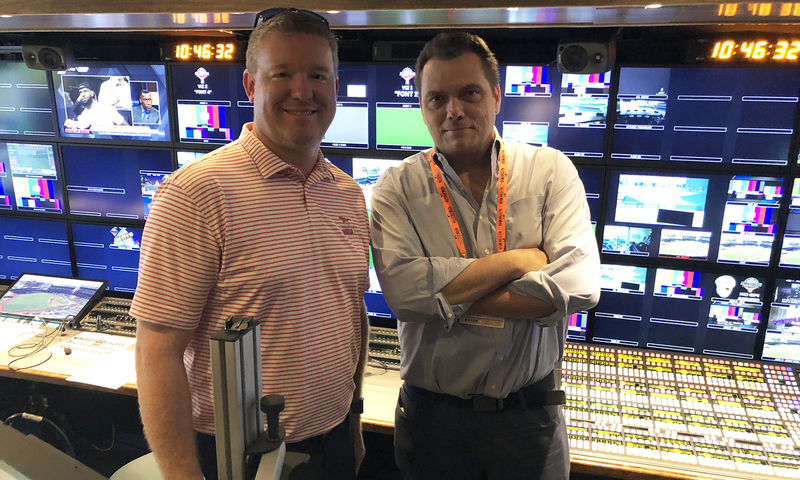 Fox Sports’ Brad Cheney (left) and Mike Davies inside Game Creek Video’s Encore truck at the MLB All-Star Game in Washington D.C.
Game Creek Video’s Edit 1 and Edit 2 are also on hand, housing a variety of Fox operations and vendors. In terms of transmission, Fox has established tri-diverse contribution paths: a fiber circuit via Century Link, its own internal network, and a satellite uplink from PSSI. The operation in Washington is fully linked to Fox Sports’ broadcast center in Los Angeles and continues to expand its use of multi-site file transfer, especially following the monumental effort for the World Cup in Russia. 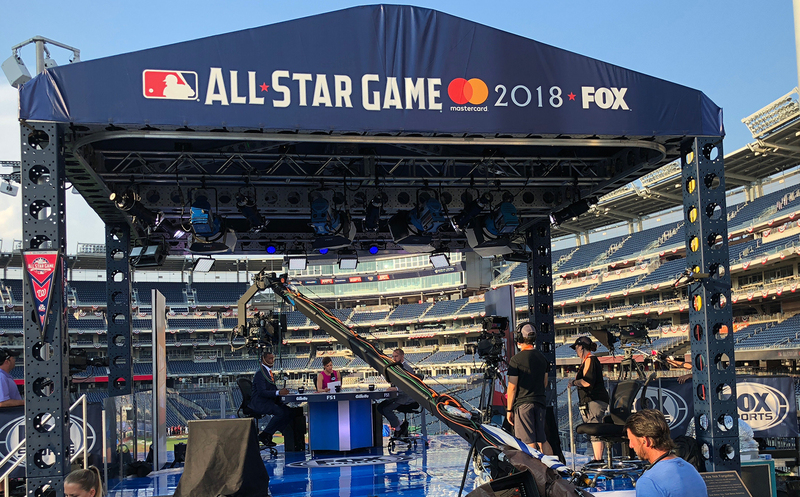 Fox Sports has deployed a slick 24- x 20-ft. set in center field for live editions of First Things First on Monday and Tuesday and the MLB All-Star Pregame and Postgame shows on Tuesday. For the past two All-Star efforts, shoulder programming like The Herd and Undisputed had an onsite set of its own, but the 6:30 a.m. start time of First Things First allowed plenty of time to turn the studio over for the primary studio shows. 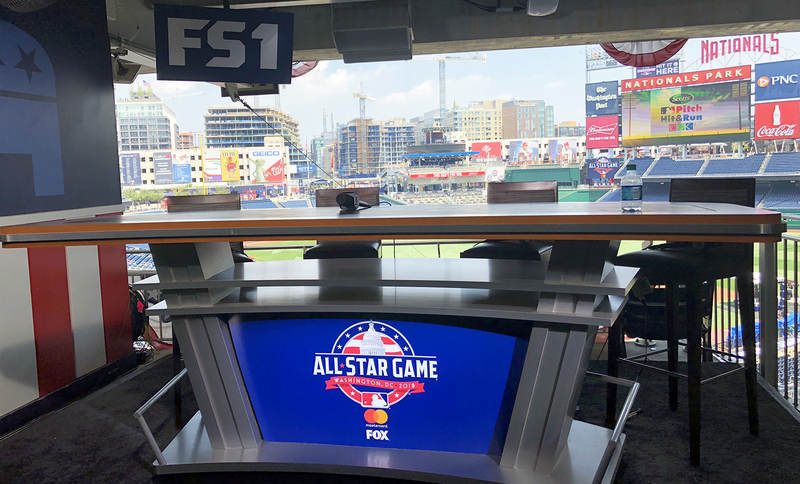 Fox Sports’ main set at MLB All-Star is serving both its pregame show and it morning show First Things First at Nationals Park. For MLB All-Star Media Day on Monday, Fox erected a separate set in Section 214 to host an MLB All-Star Preview Show. The set was located just outside the Media Day interview pods, allowing Fox to easily bring in players throughout the telecast. Fox Sports deployed a second set in section for its Media Day coverage on Monday. Fox also has a third standup position down in the belly of Nationals Park, where former All-Star and Fox Sports analyst Nick Swisher is providing exclusive digital videos and interacting with players, fans, and others.